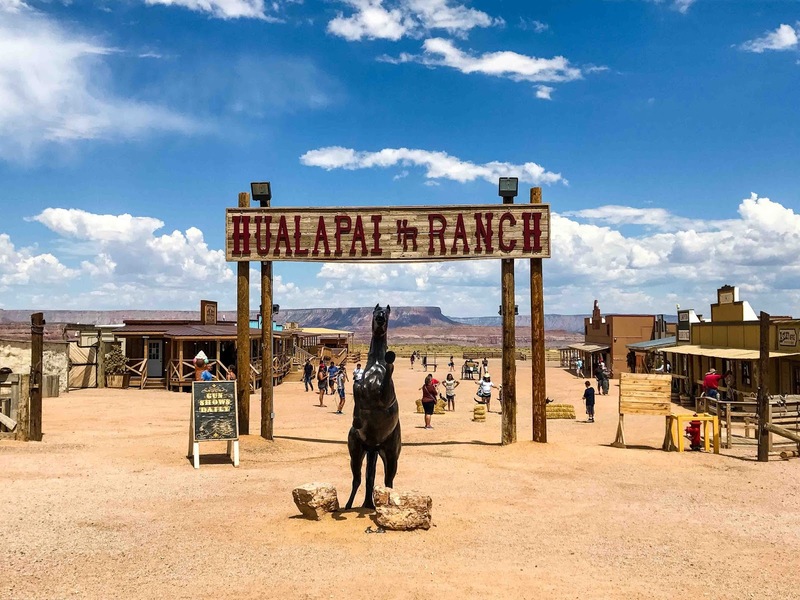 One of the stops on our Grand Canyon tour was at the Hualapai Ranch. This small resting spot didn't offer any deep canyon views, but you do get a spectacular view of the Grand Canyon's rim from this point. Honestly, we were going to skip right on by this stop of the tour and just keep riding the bus onward straight to the canyon, but it did look charming from the bus window and we couldn't resist taking a stroll through. The little town is reminiscent of the wild wild west villages. 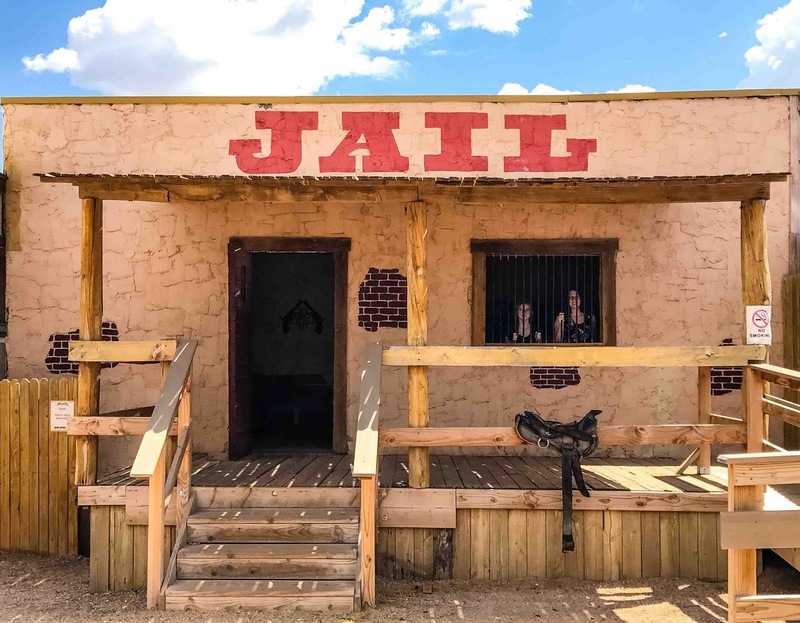 You've got your standard jailhouse, undertaker, trading post, and saloon. We were only passing through the ranch, but if you would like to take more time to explore, they do offer cabins to camp overnight. Additionally, you can do horseback riding, try out the mechanical bull, try your hand at lassoing, and take in game of horseshoes. After you are dropped off, you do have a short wait before another bus comes to take you to the next lookout point of the tour. We were here at the end of July and it was a scorcher that day. Make sure you bring at least a bottle of water with you and an umbrella or a hat to ward off the sun's rays. I wore a sunhat and brought 2 bottles of water to the Hualapai tour and still ended up drinking all of my water and got a little sunburned. 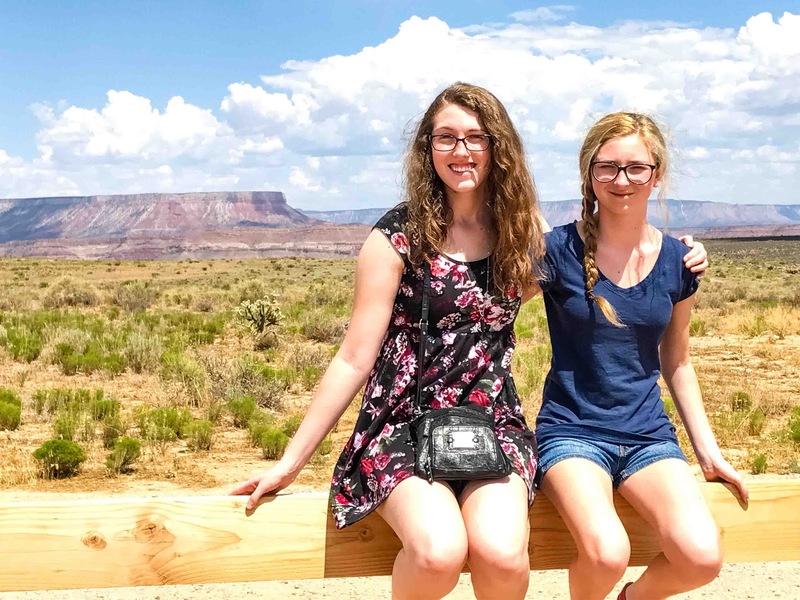 In retrospect, hanging out in the desert in July probably wasn't the smartest idea, but I am glad that we detoured to the Grand Canyon West on our west coast vacation. It's an experience my family won't soon forget. Where was your most memorable family vacation? As soon as she spied that fake coffin, she was all over it. She definitely is her mama's daughter! 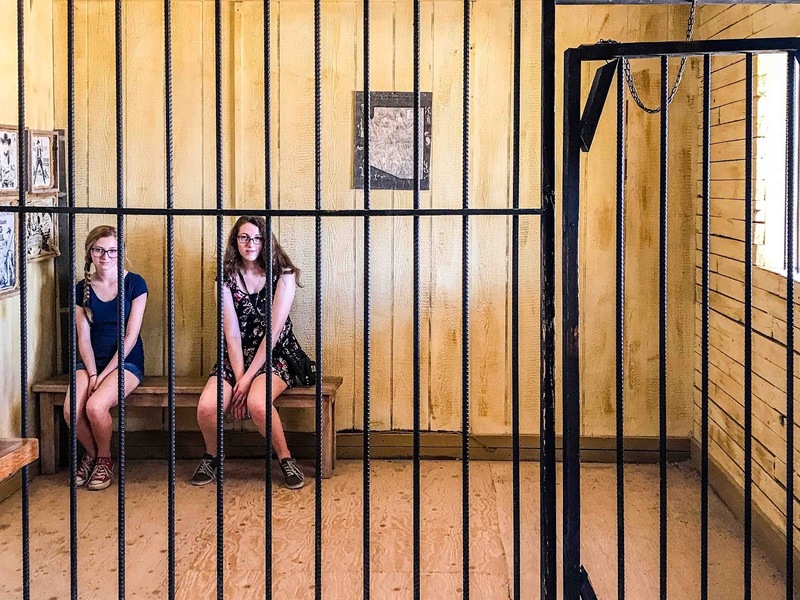 Good thing their parents were there to bail them out! haha the sign that says we don't dial 911 was neat. You got a couple of jailbirds now. A desert in July doesn't sound grand indeed, but fun was had, so that's a win. As long as they are fake jail birds, it's all good. When it spills over into real life, we've got a problem. How fun! We visited a little town like this when I was growing up. Would love to go again!! I would love to visit a real life ghost town like this. I believe there are some in the south, but I need to research on where exactly. Looks like a great spot to stop on your tour. I would love to take the kids to the Grand Canyon someday. I do hope you get there with the boys some day! I know it's hard with band and all of those theater activities, but I'm sure you'd love it if you get the chance. Looks like a fun little side-trip. We have had several fun family trips. The most memorable are 1. Table Rock State Park, in SC - we rented a cabin for the week, with my parents and my Mother-in-Law. It was lots of fun, and lots to do. 2. We stayed at a resort in Kissimmee, Florida a couple years ago, and had a condo right next door to my best friend and her family. We got to do all sorts of activities at the resort, plus spent two days at Legoland in Florida - one day at the water park, the other day riding rides and enjoying shows. Both the adults and kids had a great time - the only week vacation spent with friends, and not just family, and we had a blast! We are brainstorming on where we want to vacation next year. I am going to have to research more on Table Rock State Park, SC. I think renting a cabin would be a great way to spend a week! It's great - they have hiking for all levels, a lake for swimming with diving boards (high and low), and paddle boats. Plus there are tons of other hiking areas just a short distance away, if you wanted to try something different. It's about 30 minutes from Greenville, SC - and the downtown area is a great destination for a day trip. They have lots of great shops including a Mast General Store (if you haven't been to one, you're missing out), great restaurants, Mice on Main (which is a scavenger hunt down Main Street to find little statues of mice - our kids loved it, but my husband and I enjoyed it just as much - you can find the story and clues online), and an awesome park to stroll through with a new footbridge, waterfalls and gardens. It's one of our favorite places to go as a family. We went to the Smoky Mountains a few years back and those are the kinds of laid back vacations that I like. It sounds like it has the best of both worlds there. A little country and city combined. We are planning a move south in the next few years, probably as soon as the youngest is off to college, and not only does the area sound great for a vacation, I am going to tell my husband to put the area on his Zillow app to get a feel for the real estate. Sounds like a great place to live too! We live in the Charleston area - it's beautiful, but traffic is terrible. My husband keeps trying to get me to relocate to Greenville - more seasonal weather, and more laid back. If my kids were out of school, or if i didn't love my job so much, I would have moved before now. I thought you were in Florida, oops! We lived in Rock Hill when I was little, though I don't remember much about it. My husband said that he has looked for houses in the Greenville are and he liked that it wasn't too far of a drive from the Smoky Mountains. Only drawback is it's a little further from the ocean than we'd like to be, but after the TX flooding, I think I may reconsider my beach dreams. I've never been there but it looks like you had a good time. That is so much fun! I love going to places like this with the kids. You can feel all the old west awesome! So fun, fun, fun. This seems like such a cool representation of the old west! Exploring this ranch seemed like fun! That's a lot of fun! You always take such wonderful photos. I like the stand with your girls in it. This looks like a really cute place to stop on a Grand Canyon tour. It would be cool to camp there too. What a fun spot to visit! I haven't been there, but hopefully I'll get a chance to visit sometime. My family didn't go on vacations, because we didn't have a lot of money or we were moving. So summer vacations were with our grandmothers or great aunts, if we could get to them easily. Nova Scotia ~ PEI ~ heaven when you are a child! When I was a kid, vacations were always to out of town relatives too. Our parents would take turn hosting other kids in the family because it was an inexpensive way for us all to vacation and spend time together. This sounds like such a fun place to visit. I know my kids would love this. Glad you decided to take a stroll and tour the place! It looks like it's worth going to especially if you have kids. They're going to enjoy the sights, without a doubt. Looks like a fun family vacation, even if the weather was blazing hot. I have not traveled that far, but I hope I do get to visit the Grand Canyon too. Oh wow, this is so nice! I've never been here before and it's so nice that you shared your experience. I think it's definitely worth going to! The Grand Canyon is so much fun. My kids always look forward to us going there. We have always wanted to visit the Grand Canyon. What a beautiful and unforgettable place. Yes, July is SO hot there! It's worth it though especially since it's more of a dry heat and not as heavy feeling. How fun! 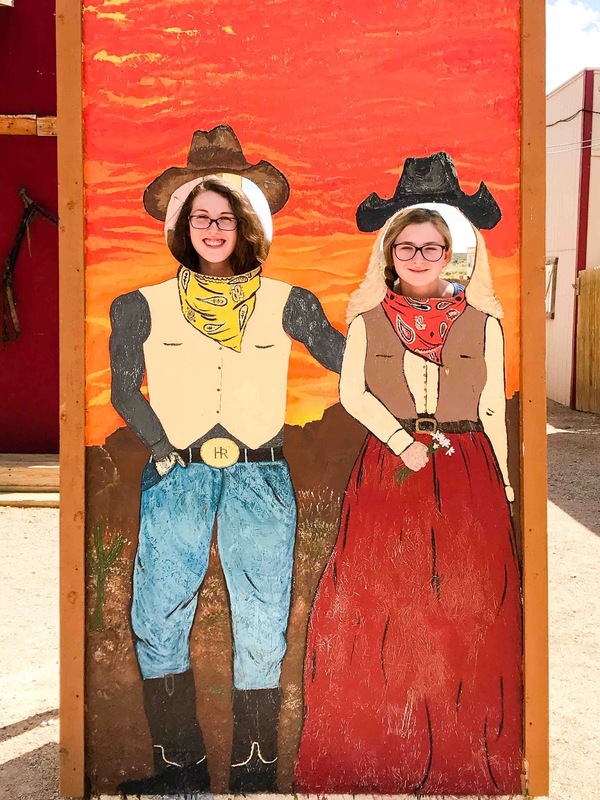 My kids love themed adventures so I can totally picture them dressing up in cowboy garb to explore Hualapai Ranch! Looks like fun! What a cool place! I'm loving the pictures from your trip ! Cute photos! We didn't visit this part of Grand Canyon when we were there, because we spent the whole day on the East side. All those hikings and taking pictures here and there really drained our energy. But this looks like something that we can recommend to those visiting the area.. I agree! It's a lot of desert walking and that does drain the body quite quickly. But the views do make it easier to push on. Someday I will be as well traveled as you Rosey! You've definitely been to some amazing places! Looks like a fun experience. 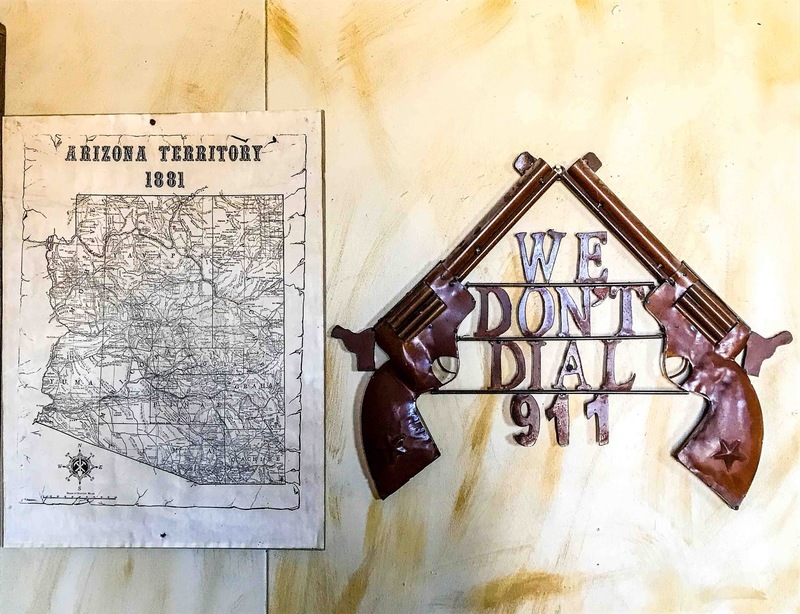 I love that "We don't dial 911" sign.